A new addition with a classic style. Made from Poly-Tech fleece, this lightweight track jacket is water-resistant and moisture-wicking. Dual white stripe shoulders and sleeves with rib-knit cuffs and waistband. Interior media pocket with eyelet. 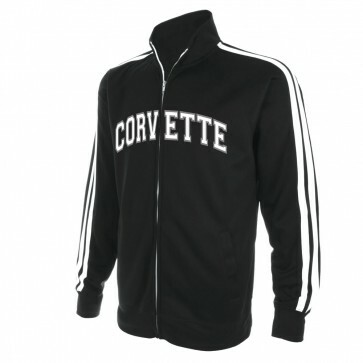 Features a full-front Corvette appliqué and C7 crossed flags embroidered on back yoke. 100% polyester. Imported.